Equity Valuations No Longer Matter? One factor utilized in uncovering potential investment opportunities is to evaluate companies and sectors that are projected to generate strong earnings and cash flow growth over the course of the next year or more. The risk associated with simply reviewing earnings growth rates is the fact other variables often influence the future price performance of a company's stock. A good case in point at the moment can be found in evaluating energy companies and the associated sector. For calendar year 2017 and 2018, the energy sector is expected to exhibit the highest earnings growth rate among all the S&P 500 sectors. For 2017 the year over year earnings growth rate for the energy sector is estimated to equal over 300%. In 2018 the YOY growth rate is projected to equal 41.3%. Even reviewing the sector PEG ratios (P/E to earnings growth rate), the energy sector looks very attractive and is the only sector that has a PEG below 1.0. Today the American Association of Individual Investors released their Sentiment Survey results for the week ending 7/19/2017. These results show individual investors' bullish sentiment increased 7.3 percentage points to 35.5%. This is the highest reading since early May when bullish sentiment was reported at 38.1%. 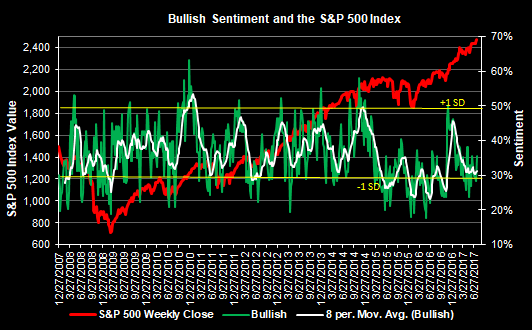 This jump in bullish sentiment still has the level below the long run average of 38.5%. The increase in the bullish reading came almost equally from a reduction in those investors indicating they were bearish and those reporting a neutral view of the markets. This is a contrarian measure and remains at a fairly low level. On the other hand, the market continues to achieve record highs with very little downside volatility. A pullback of 5-10% would not be a surprise given the market's recent strength.